Ever thought of an ear tattoo? Trend shows that men prefer getting tattoos right on their ears due to a number of reasons; this is because ear tattoos normally occupy relatively small areas thus not conspicuous, they are not necessarily pierced and if professionally done, brings out the masculine and powerful nature of men; the ear area also looks attractive if inscribed with a good design. Ear tattoo ideas are generally small due to the small working area; most of the amazing designs are restricted due to the small area around the ear. Ear designs can be carried on, around or near the ear. On the ear – Due to its curvy and unique shape, designs must be well chosen to fit. Around or near the ear – Due to availability of space around the ear, the following designs can be considered; stars, hearts, flowers, mixed shape patterns, diamonds, infinity signs. Here clients are spoilt for designs to choose from since the designer can easily manipulate these designs around the ear. 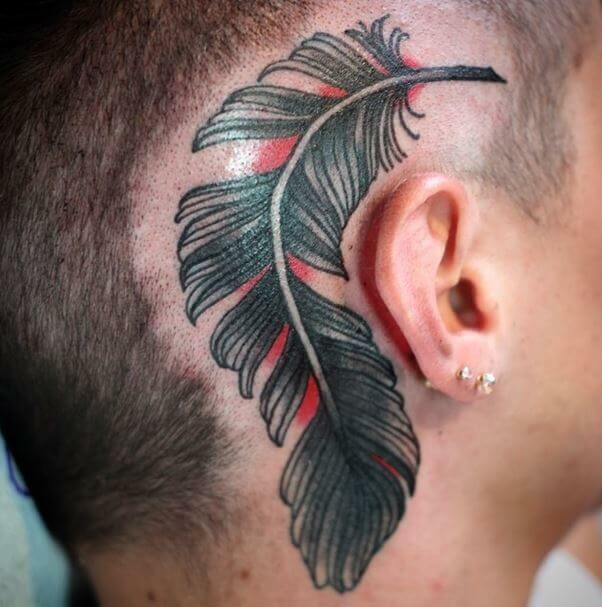 Tattoos around the ear also bring out the masculine and powerful nature of men. 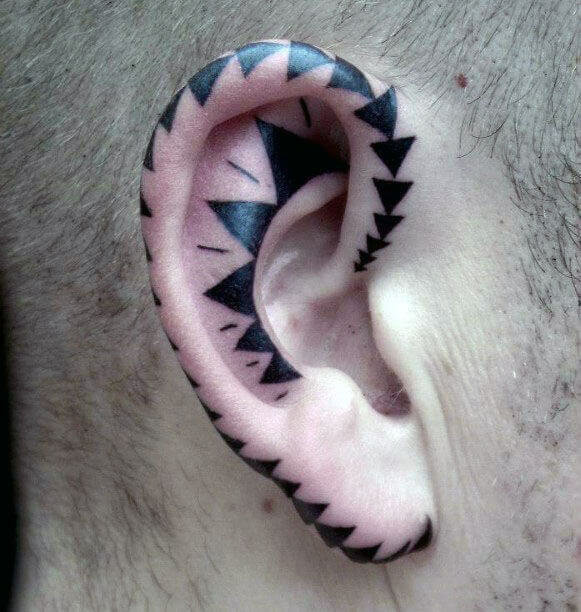 What are the Most Popular Ear Tattoo Designs Available? Goliath Design – This design depicts the epic battle between David and Goliath from the bible, contrary to David’s victory, a lot of people do Goliath’s image design to show a feel of power. Dragons – They are known to be fiery, powerful and supernatural. Dragon designs are associated with strength, power and commands a lot of respect and influence. On the contrary, they symbolize envy and the desire to be immortal. Phases of the-moon – The moon stands for living. The different phases used in tattoo designs depict the changing nature of life; it reminds us how life is inconsistent. The circling nature of life is well elaborate by these moon designs. Celtic Knot Designs – These designs represent perpetuity and eternity since it is believed that Celtic knots don’t contain beginnings/ends. The two most commonly recognized tattoo designs in this category are the Celtic-Cross and the Trinity-Knot, the Cross is a-religious symbol that signifies-different things, depending-on the religion setting. X Design – Either way, this is translated according to ones perception, but the most common meaning is that it is a sign of experience or commemorating the loss of a loved one. 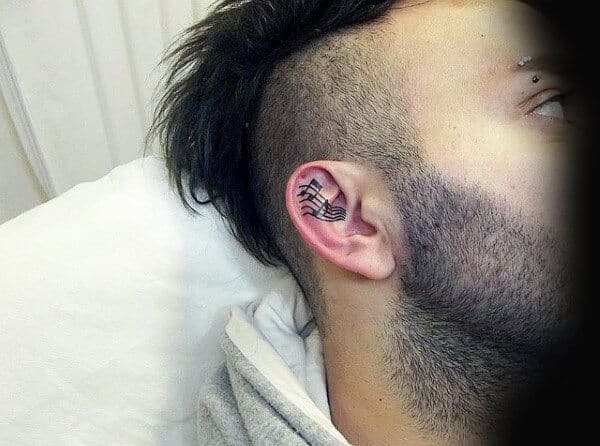 Ear is one of the most sensitive organs of the body, it may be a painful experience to a number of guys going for ear tattoo; this can lead to headaches and migraines. 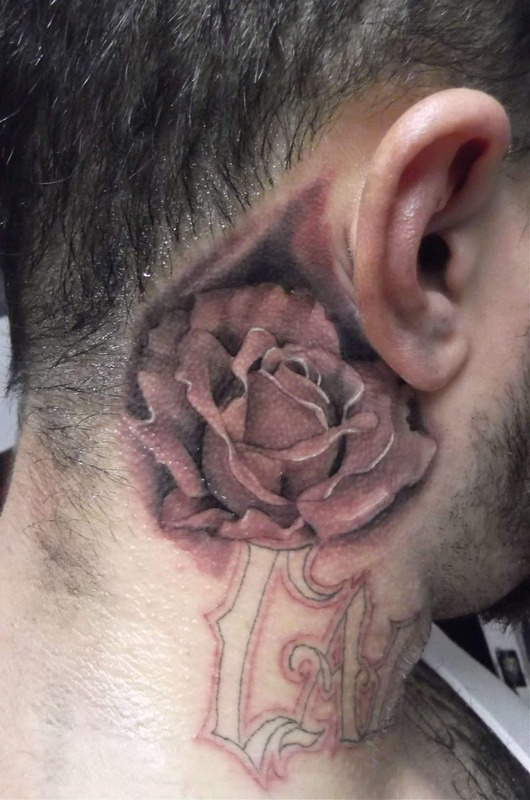 Good ear tattoo designers are hard to come by since it requires attention to detail and professionalism, it is advisable to shop around for the best value; they should also be performed in clean environment under the supervision of a professional. Music to the ear, literally. That might be what this guy is trying to say with his ear tattoo. The tatt comes with a simple design but could be carrying a deep meaning. All in all, it qualifies as one of the best designs. The elegance of this tattoo is in its design. It features a pattern-like design that is both basic and classy. You can also notice the glossiness of the tattoo, which makes it extra appealing. The tattoo doesn’t look like it has a specific meaning. Oh, the artistry and uniqueness of this tatt. It is one design that will draw your attention, and you will want to have a closer look at it. This tattoo might have a hidden meaning, or the guy just wanted to look unique with it. 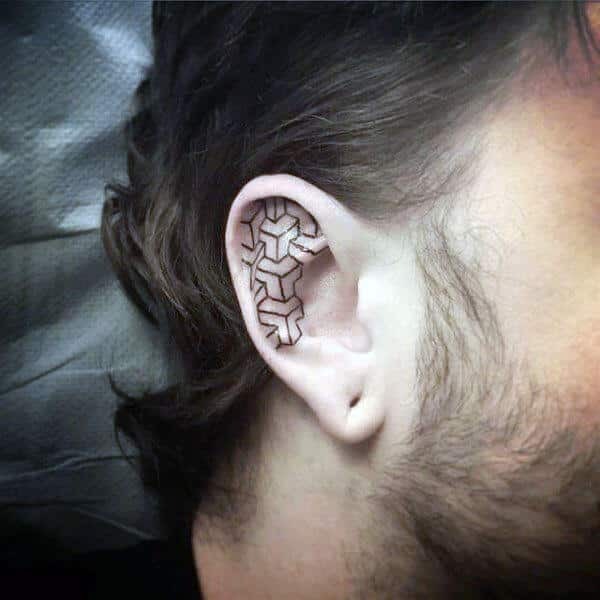 This is one of the ear tattoos that will fool you when you look at it for the first time. 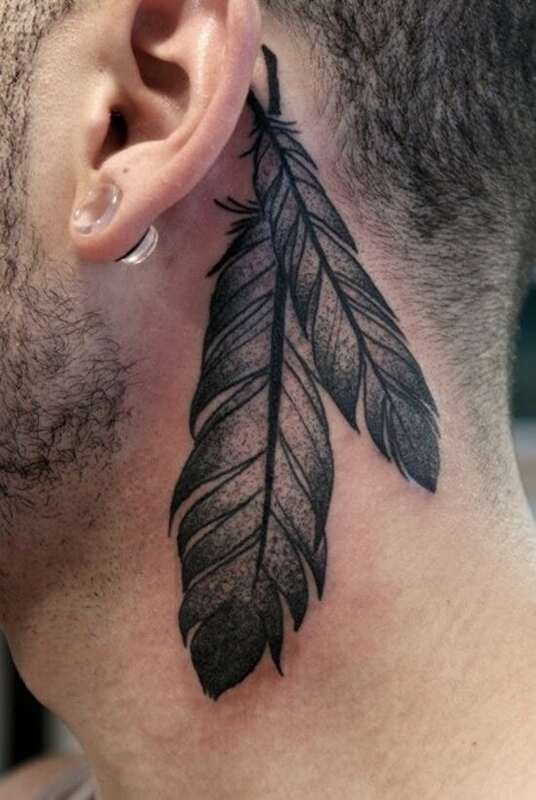 From a distance, you would think that the guy has two feathers hanging from his ear. The 3D effects make this tattoo super amazing. What a stylish tattoo! The guy has applied the tatt with a blend of colors that gives it a cool design. 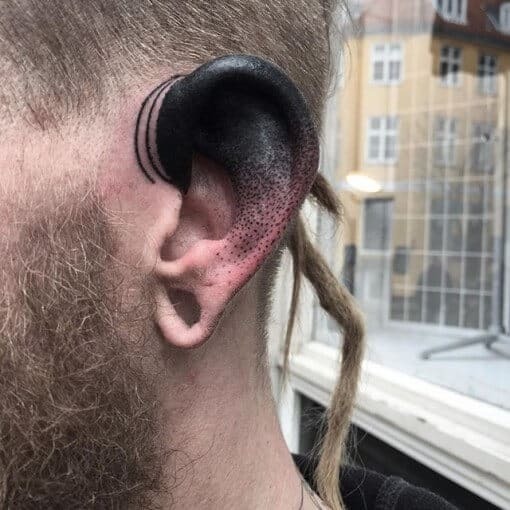 The black and red colors blend perfectly to make it one of the best ear tattoos you would want to consider. 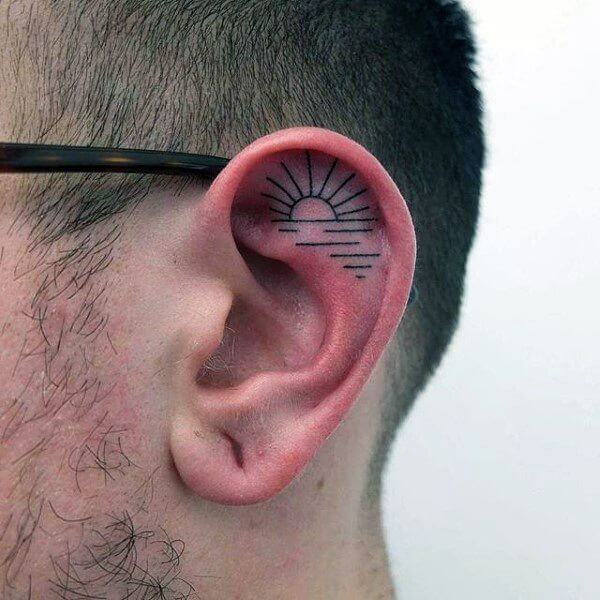 When you look at this tattoo at first, you could think that the guy has a scar behind his ear. On the contrary, it is a cool flower tattoo that has been applied with high 3D effects levels to make it stand out. 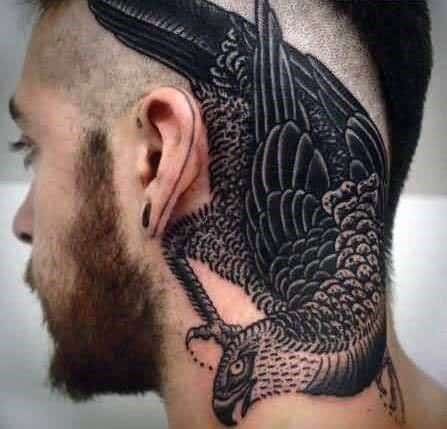 This guy is definitely a lover of the tattooing art, and he is proud of his bird tattoo behind the ear. The bird stretches towards the side of the head, and it is one great design to consider. Super cool. Simple, but classy. 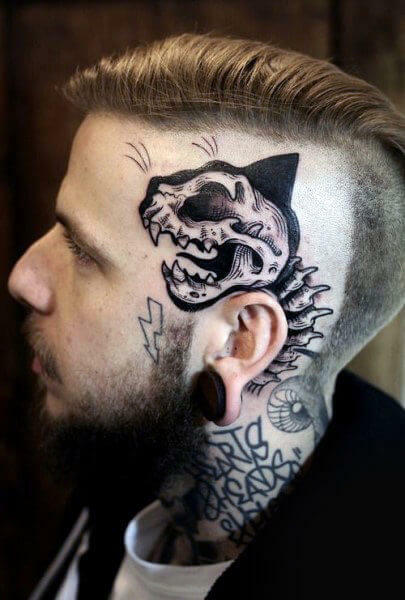 This is one great ear tattoo design that must be having a hidden meaning. It depicts a sunset, which is applied with a basic style. You may not even realize it from afar, but this tattoo is pretty cool. Whether this is a set of triangles, saw teeth, or the guy was applying them to mimic a set of canine teeth, this tattoo makes it as one of the best. The deep black color makes it noticeable with ease. Now, this looks bizarre. It features a cat design, which is applied with a skeletal structure that has a scary-looking skull. With such a design, this tattoo must be carrying a specific meaning. The color theme is basic, but the tattoo can still grab anyone’s attention.